Elizabeth Peck donated this collection to the Washington State University Libraries in 2001. 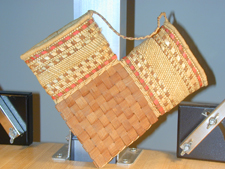 These artifacts are related to the papers, audio recordings, and other materials in Cage 671, the Charles and Elizabeth Peck Collection of Northwest Coast Indian Life, 1958-2000. The collection was processed in 2005 by Cheryl Gunselman, Manuscripts Librarian. The images included in this guide were taken by Michael Walpole, graphic designer, in conjunction with the processing of the collection. Additional images (slides and/or photographic prints) of many of these items are also included in Cage 671. Charles Peck was born May 22, 1914, in Hazard, Kentucky. He graduated from West Virginia University School of Forestry in 1939 and received a master’s degree in public administration and economics from the University of Colorado in 1963. In 1967 he joined the Agricultural Extension Service at Washington State University as an Information Specialist. He served as a county extension agent for WSU in Cowlitz, Mason and Spokane counties. In 1970 he produced a series of photographs expressing the meaning of responsible land use management, with the Queets River basin serving as the site for his study. "Little did we know that the central issue of the sabbatical would swiftly gravitate to trying to develop a comfortable and lasting rapport with the Quinault Indians of Queets, and to learn something of their culture. We were to find such work often sobering and difficult, but always exciting. We were to find trust developing slowly. But finally were able to make friends with the generous and gifted people." While in Queets they lived among the Pacific coast Native American tribes of Washington State, documenting and recording their history and music. Elizabeth’s musical interests helped ease fears among tribal elders that their musical heritage would, in short order, become irretrievably lost: she preserved and documented some of this heritage in hundreds of hours of recorded material and in the work she did for her master’s thesis, “Songs of the Bogachiel.” There she attempted to understand the power of a family song from a Quileute point of view, focusing on the role of song ownership. She received her master’s degree in 1973 from Washington State University Department of Music. Elizabeth also taught at the Queets-Clearwater school and was an avid seamstress. Charles photographed a variety of subjects, but he especially enjoyed photographing Indian children. He published some of those photos in an ABC book for children. His photos have been displayed throughout the Northwest, including Portland and Seattle. In addition to his photography he became known on the reservation for his drum-making skills and as an avid fisherman. The artifacts are grouped by object type. The quotations in the descriptions for the baskets and deer hooves are taken from Elizabeth Peck’s notes (included in Box 6). The item numbers reflect the current arrangement of the collection. The basket and drum numbers are the original numbers assigned by Peck. 1 1 Miscellaneous 1: Deer hooves. Accompanying note reads in part: "Used for rattles attached to sticks or wrist rings, on ankles, clothing, medicine sticks and many other ways." 2 2 Miscellaneous 2: Loose bear grass leaves, dried. 3 Drum 2. 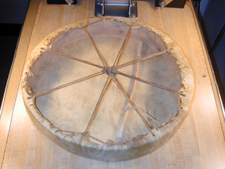 Inscription: "This drum by Charles K. Peck, Queets, Wash., August 5, 1971. Head: Mule Deer; Lacing: Elk; Frame: W. R. Cedar; Made for: Elizabeth (Libby) T. Peck. Drum Number 2." 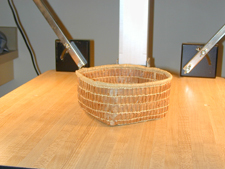 3 4 Basket 4: "A Makah basket...made of cedar bark." 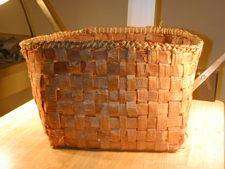 5 Basket 13: "Made by Leila Penn Fisher, Hoh...Materials: cedar bark, bear grass, bottom grass base?" Includes lid. 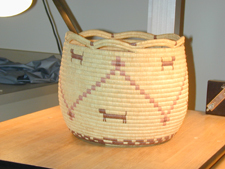 6 Basket 15: "Made by Helen Sailto Lee, Hoh Indian." Includes lid. 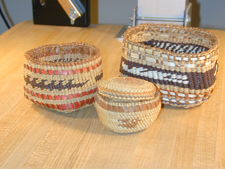 7 Basket 20: "By a Neah Bay Indian." Includes lid. 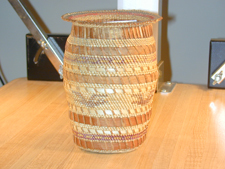 8 Basket 21: "A British Columbia basket via Mary ‘Lilybelle’ Williams." Includes lid. 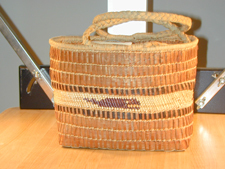 9 Basket 22: "Made by Mrs. Howard Logan of Queets, WA." Includes lid. 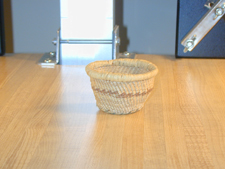 10 Basket 29: "Miniature harpoon point holder. A gift from the Ward family, Neah Bay, WA. Used as a tourist item to hold mail." 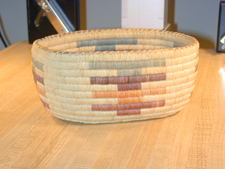 11 Basket 17: "By Freda Charles Kalama of Queets, WA. 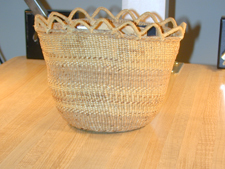 An early basket made in 1970...Freda had not learned to make lids." 12 Basket 23: "Made in British Columbia. Purchased by Mary Williams when she visited her B.C. Indian friends." Includes lid. 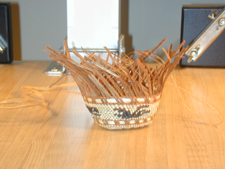 13 Basket 40: "Woven by Mrs. Chet Pulcifer (Elvira), Lummi heritage, of Queets, WA." 14 Basket 41: "By Alvira Pulcifer, Queets." 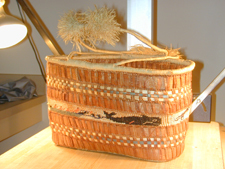 16 Basket 35: "By Dorothy Flynn, Queets, WA." 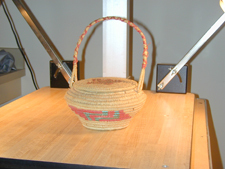 Basket with "fishbone" design. 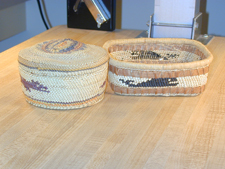 20 Basket 2: "By Makah of Neah Bay." 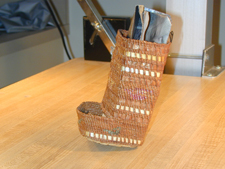 22 Basket 10: "Made by Leila Penn Fisher, Hoh…Basket materials are cedar bark, Bear Grass or ‘straw’ and raffia." 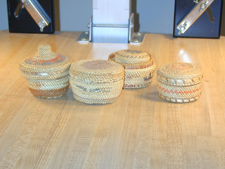 24 Basket 24: "Match holder basketry by Charlotte Kalama, Quileute." 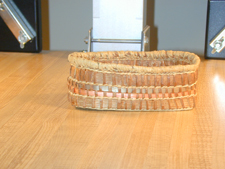 25 Basket 25: "Woven cedar bark match holder—Makah." 26 Basket 42: "Louise Pulcifer—Skokomish." 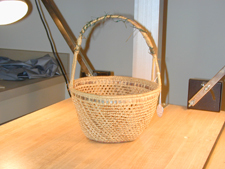 28 Basket 8: "Makah shopping basket." 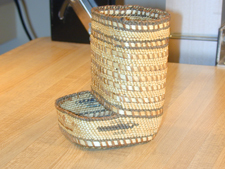 29 Basket 9: "Makah shopping basket by Irene Ward." 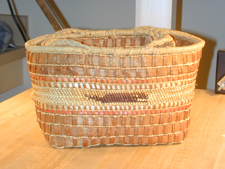 31 Basket 33: "Made by Elizabeth Peck who lived in Queets 1970-1973." 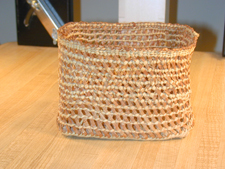 32 Basket 44: "Half completed by Mary K. Leitka, daughter of Leila Penn Fisher…Elizabeth wanted this basket as an example of making baskets." 6 33 Whalebone, carved in shape of sword. 34 Carved wooden paddle. Photo attached, with inscription "Captain Sam, Queets, Olympic, 1931." On opposite side, marked "Harry Sam, Born Dec. 24, 1900." 4 Supporting documentation (miscellaneous). Includes newspaper article about Charlotte Kalama: "Weaving Life—One Strand at a Time," The Daily World, 4 August 2002.